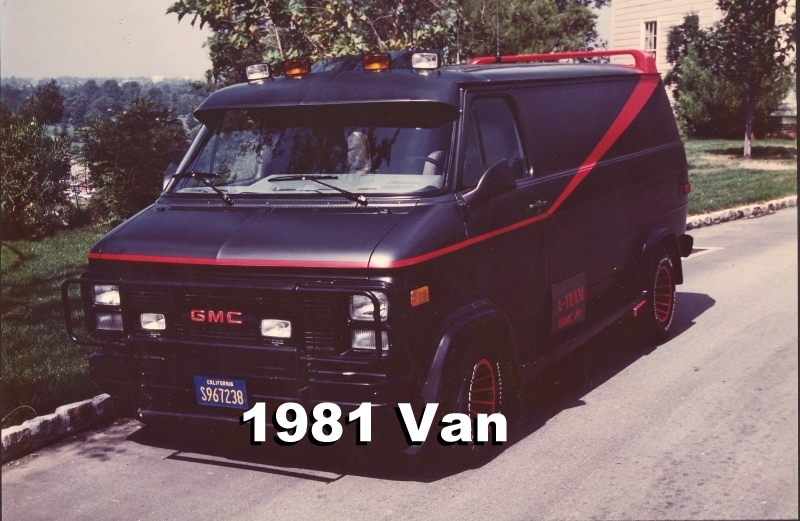 The bad guys couldn’t get enough of these on TV; painting them as delivery trucks for kidnapping the daughter of a wealthy family or transporting stolen goods to a deserted warehouse. 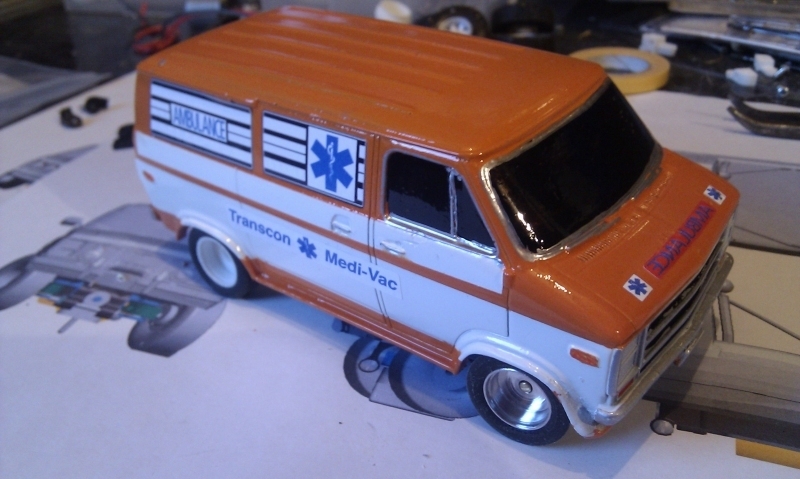 Or if you’re planning a coast to coast race you might decide that this van painted as an ambulance will help you win. Maybe you’ll paint it black and grey with a red stripe and decide it’s the best form of transport for soldiers of fortune. 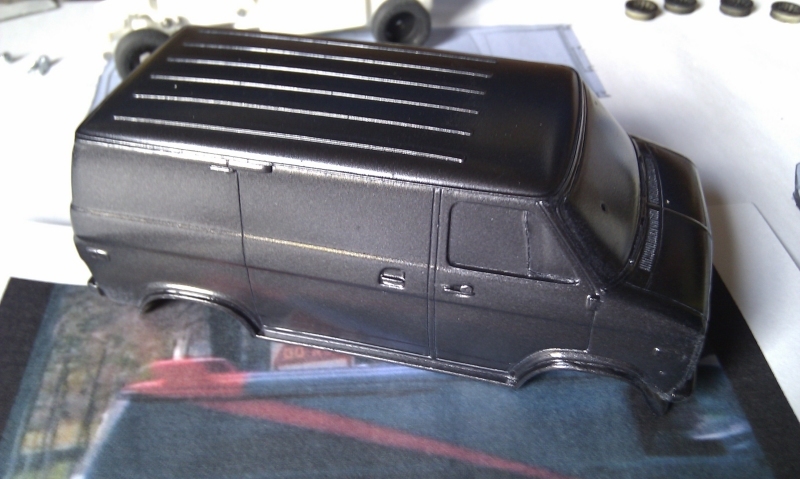 The 1:32 resin bodyshell is cast from a 2 part mould with body mounts already fitted, and the windows are much thinner and easier to cut out than with my older bodyshells. 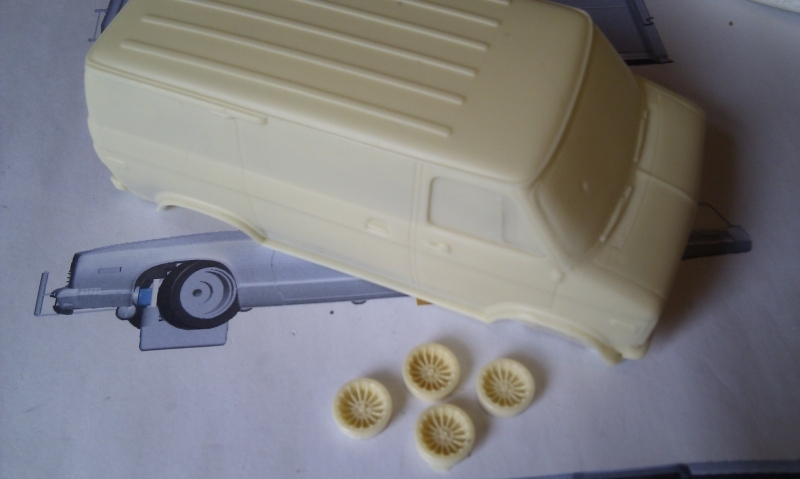 Bodyshell preparation is here, detail follows below. 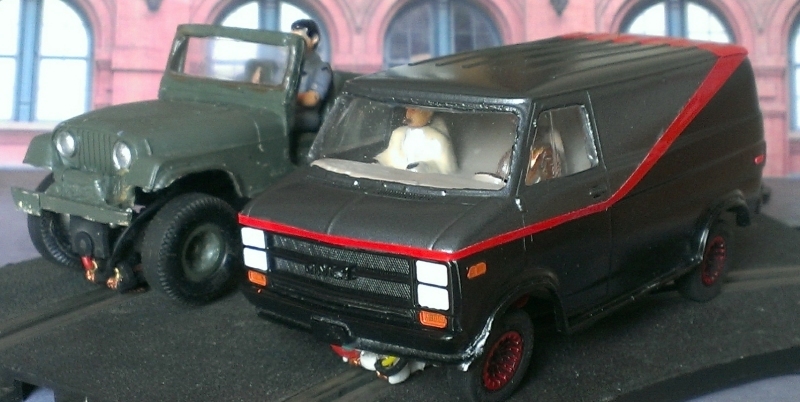 I then masked off the lower half, and painted it black, then masked again and did the stripe. After a few attempts at painting the stripe, I found that you get a much stronger red using some adhesive red vinyl, available from craft shops. 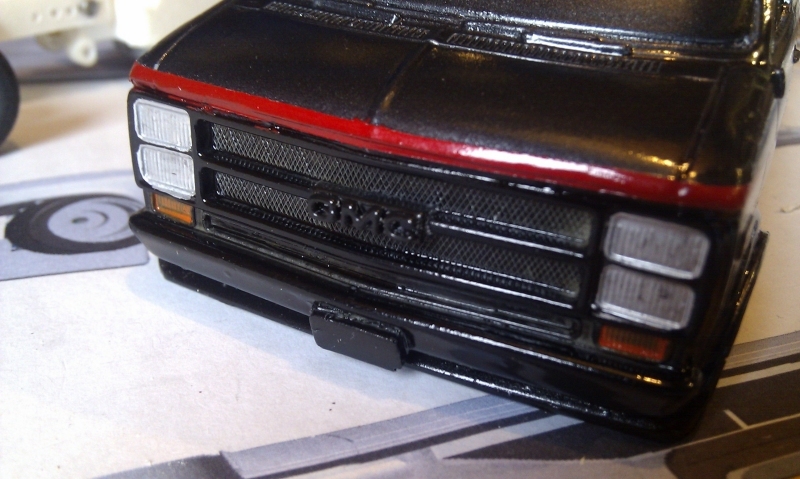 Some orange paint on the marker lights and indicators, silver on the front lights and red on the rear lights and it’s looking much better. Now you can fit the windows, always use glue suitable for windows – sometimes it’s called Canopy glue but as long as it doesn’t bloom it should be ok.
For the interior, you need to make a bulkhead behind the seats so you can’t see into the empty space in the back of the van. Use the vacform interior and just bend up the rear section, then cut to size. If you’re using my chassis the track is much wider. The rear axle can be the standard one but with the wheels slid wider apart, but for the front you need to fit some spacers and make the stub axles a little longer. These are just Nylon washers, if you don’t have any drop me an e-mail and I’ll post some to you free. 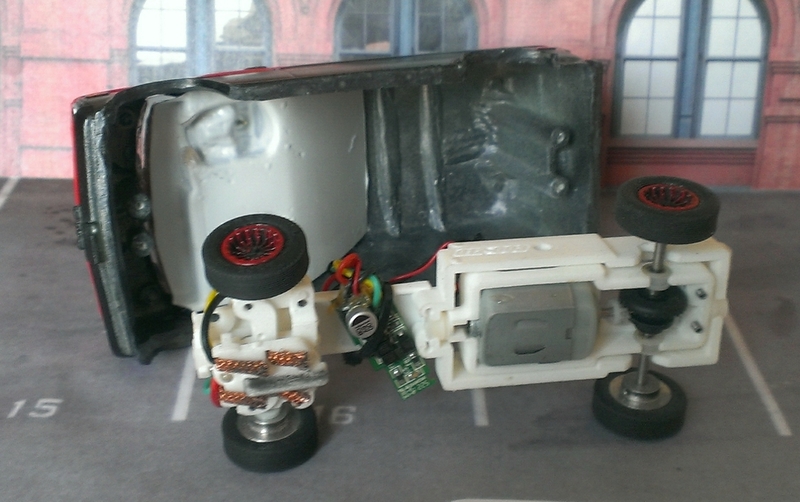 If you’re using my chassis you will need to fit heavier springs on the motor pod, to help support the weight. 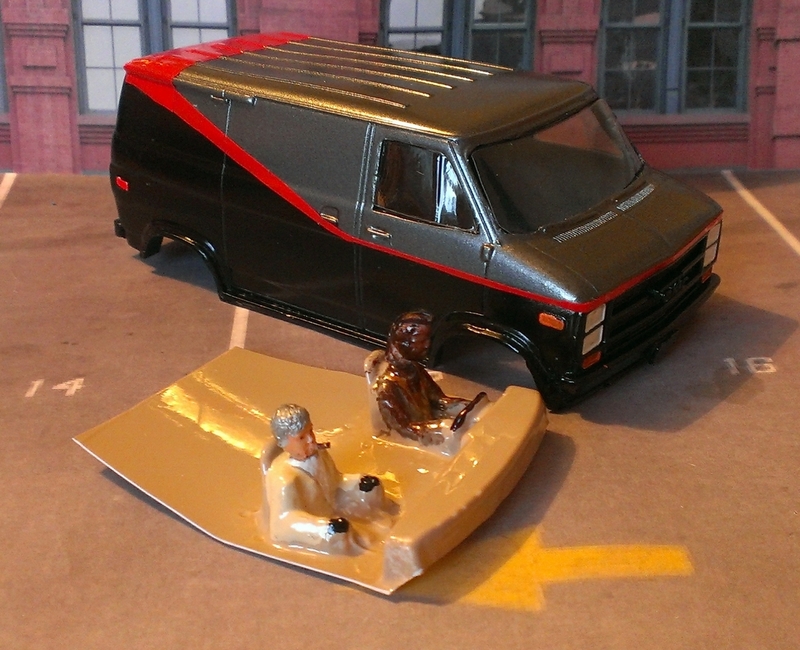 There’s also a graphics kit available for the Cannonball Run ambulance. Let me know if you’d like one.